As the lights dimmed, the performers of Raffles Chamber Ensemble, decked out in their chic tuxedos and dresses, made a dazzling entrance for their annual concert, Intime. Meanwhile, the eager audience prepared themselves for a night with much to enjoy in the way of sophistication. Playing Andante Cantabile as one ensemble. The concert promptly commenced with II Andante Cantabile, by renowned Russian composer Tchaikovsky – a solemn piece characterised by underlying melancholic tunes. As dismal as that sounds, on the contrary the bittersweet wistfulness brought out by the orchestra’s passionate playing had made for an engaging listening experience. The chamber piece, Schubert’s Piano Quintet in A Major. Following that, the ensemble progressed with several other classical pieces from the Romantic period, notably four movements from Carl Reinecke’s massive Serenade for Strings in G Minor, Op. 242. One might criticize the inaccessibility and esoteric nature of these songs to the average JC student, but these sufficiently encompassed a spectrum of moods, from introspective to intense, displaying the musicians’ versatility as well as mastery. Among other pieces, Schubert’s Piano Quintet in A Major was enjoyable for its sprightliness; the high-pitched violin soaring above the other string instruments, echoing and engaging in pleasant harmony with the piano. The stage layout during Hansel and Gretel. The best moments of the night, surely, came after the intermission, which marked a transformation in atmosphere. Garbed casually in bright, striking colours that contrasted with the earlier minimalist attire, the orchestra first embarked on Hansel and Gretel, a musical arranged by their very own musician Yee Yang En (16S06B). Hansel stands between Gretel (right) and the Prince (left). A narratorial voiceover and backgrounds on the projector supported the storyline based on the well-known fairytale of the same name (the musical was a sequel, picking up from after Hansel and Gretel found their way out of the witch’s house). Hansel and Gretel, charmingly portrayed by Wong Jia Yi (16S03A) and Yee Yang En, skipped out in tartan outfits, while cellist Heidi Ngo (15S06K), was convincingly decked out as a witch. A medley narrated the brother-and-sister pair’s growth into wiser adolescents, which consisted of recognisable songs from pop culture and musicals. These included the likes of All I Ask Of You (from The Phantom of the Opera), For Good (from Wicked), Bruno Mars’s Marry You and Maroon 5’s Maps. Though relying on a clichéd trope of romance, it was nonetheless refreshingly light-hearted, a welcome counterpoint to the hitherto sombre mood of the concert. 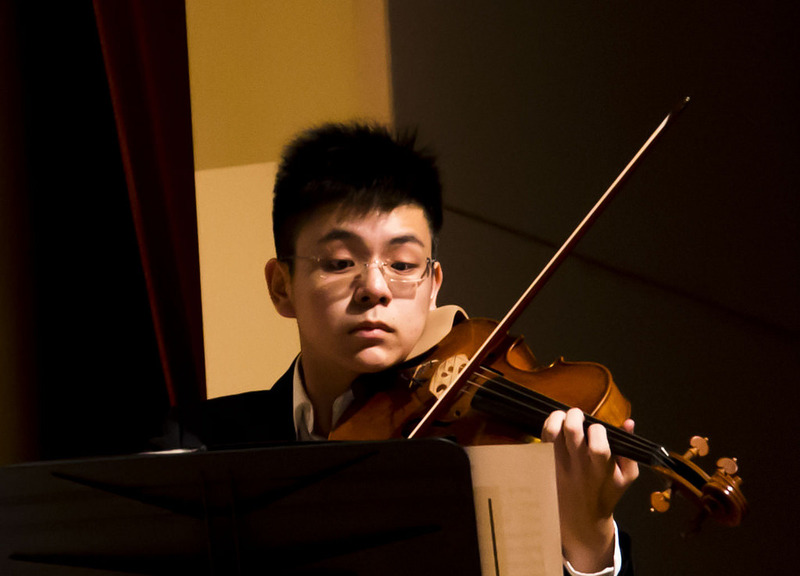 To the audience’s surprise, the musicians had more tricks up their sleeves afterwards; the full orchestra reemerged in formal wear to conclude the evening with Vivaldi’s Spring. 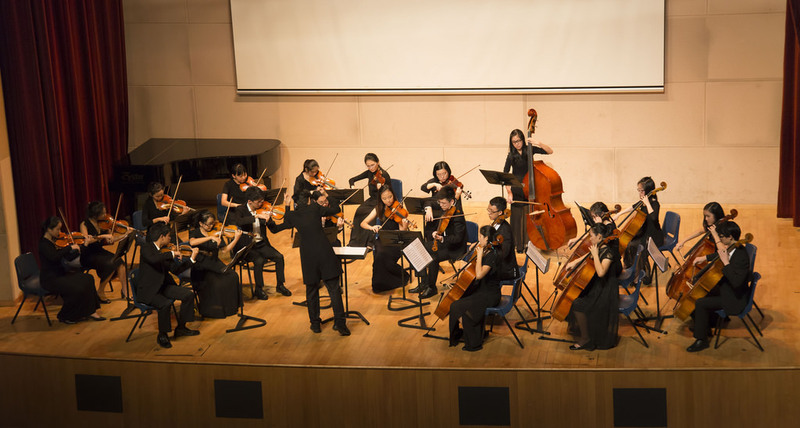 One last surprise was unfurled there and then: Wu Chin Ying (15S03R) “paused” the whole orchestra with a point of a remote control as she walked in from the side – and then revealed that the ensemble was entirely under the influence of her remote control. The audience was thereafter taken through a supremely entertaining and surreal showcase of the remote control’s various functions (Play, Pause, Mute, and Volume Control, among others). Chin Ying fit into her part as Remote Controller remarkably, delivering her lines with the right amount of panache and hilarious verve. “Just enjoy that clarity of sound!” she exhorted as she clicked on Play. “Now you know why we can’t live life backwards – it sounds terrible,” she said while pressing on Rewind. “Come guys, wallow in self pity!” she urged as the orchestra broke into the main theme of Schindler’s List. 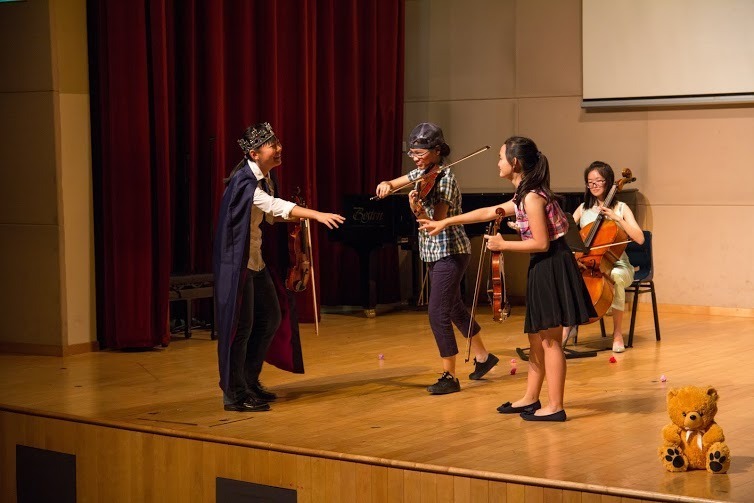 This delightful mélange of theatre and chamber music was ended with their very sporting conductor, Ms Marietta Ku, wobbling off stage in a mechanical fashion. Initially, some of the humour and fun in the production had seemed incongruous with the general tone of the concert. A behind-the-scenes video of bloopers and amusing captions like “very intense swordfighting” (rendered lovingly in Comic Sans) cracked the audience up – but as the concert progressed one realised that the comedy had been part of the plan all along. In fact, the Ensemble had successfully produced a refined yet relatable performance because of it, by marrying contemporary tunes with stereotypically ‘high-brow’ chamber music. Safe to say, it was a school production at heart, and a great one at that. 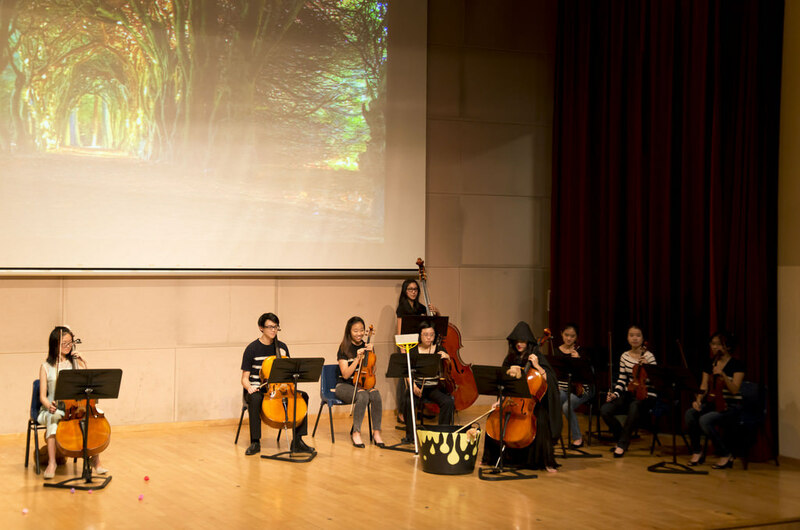 Beyond the final production seen by the public, Farah Wu, incoming Vice-Chairperson, also shared that Intime had been meaningful for the Ensemble: “Intime had brought everyone together as one family – especially through the fun and laughter we shared when we played as one remote-controlled orchestra! The late night rehearsals are memories we’ll cherish forever.” No wonder then, seeing the effort they had put in, that the orchestra had thoroughly impressed us with their fresh performance and shown us another side to classical music! 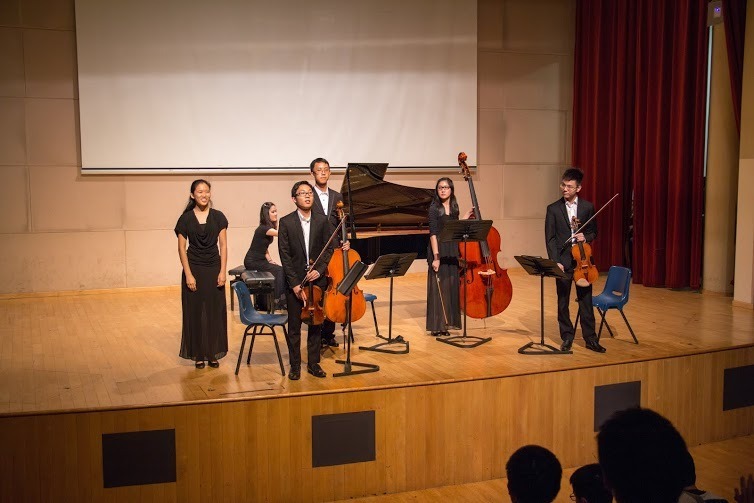 Raffles Press would like to thank Raffles Chamber Ensemble for holding this delightful and well-executed concert.